Holmfields is a family business who specialise in helping you to create your dream space. Whether it be a kitchen, bedroom, or that longed for home office, we have been serving residents in Market Harborough since 1995. Our experience and expertise allow us to offer the full service. From the design process to manufacturing and installing your new room. We use computer software to help you to visualise your ideas before manufacture. 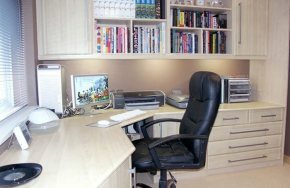 Over the years we have built an amazing reputation across Market Harborough having become one of the leading bespoke home office suppliers in the area. Our practical approach to creating a home office allows us to create you a space that encourages productivity whilst also giving it a look of comfort that is personal to you. We will discuss your requirements to allow for your home office to consist of the essentials that you need to work sufficiently from your home in Market Harborough. These can include a desk and workstation, filing cabinets, bookcases and many other necessities. Whether you’re looking for a traditional, or contemporary look, Holmfields can create a bespoke fitted bedroom that is perfectly suited to the style of your home. Each bedroom is individually designed to maximise the space that you have. High quality fitted wardrobes allow for a large amount of storage space with interior shelving, interior drawers and shoe racks available. Our range of fitted bedroom furniture includes our very own contemporary doors in vinyl and solid wood. 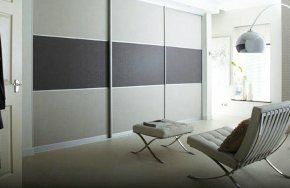 We also offer the option of sliding or hinged doors, to help when maximising your floor space. As well as providing beautiful fitted bedrooms and home offices, we also design manufacture and fit a variety of kitchens. 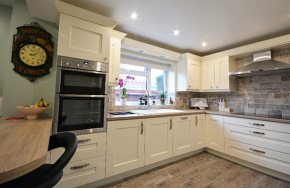 Having the ability to create traditional, contemporary and shaker style kitchens allows us to design something that seamlessly fits in with the current style of your property in Market Harborough. Our showroom is based just 17 miles from Market Harborough. Here you can see a wide range of our kitchens and appliances to help you with some inspiration. Whatever it is that you require, our team of designers will fully listen to your needs and ideas to put together something that is truly unique to you. We will provide a competitive quote and we promise there are no hidden costs. Once we know exactly what you want and you’re happy with everything, we can get on with the job. To speak with our team, please either visit our showroom, contact us on 0116 255 6669, or get in touch through our online contact form. We’ve been designing and fitting kitchens and bedrooms for over 20 years. Kitchens and Bathrooms are our passion and we pride ourselves in providing excellent customer service and great value. Full kitchen design service offering expert advice and design services. Transform your bedroom’s décor, making the most of all your space. Leading supplier of bespoke home studies, designed around you.